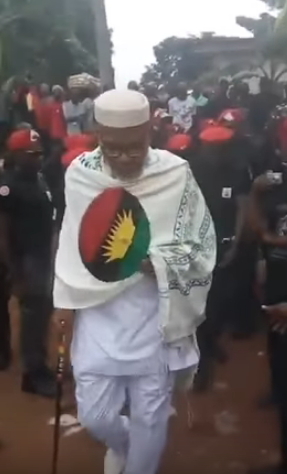 IPOB Leader Mazi Nnamdi is now getting ready to be sworn in as the President of Biafra’s Republic. 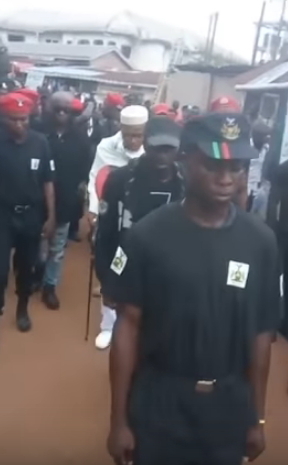 Yesterday, the controversial figure who now carries himself as the bonafide leader of Biafra received a courtesy visit from the Niger Delta Militants who have now raised a group of warriors and Secret Service Agents to help defend Biafra ahead of October 1st. 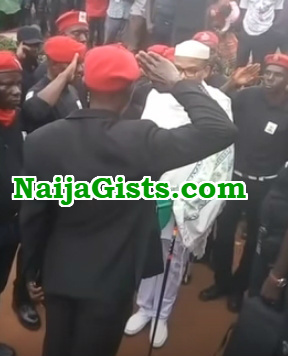 Kanu inspected the soldiers and the Secret Service agents before he was given a guard of honour in Umuahia Abia state. Tension is currently building in some part of the South East due to Kanu’s open association with the dreaded Naija Delta militants . After watching the above video, most Igbos have dissociated themselves from him as many accused him of having a different agenda. NO IGBOS DISSOCIATED from him abeg! 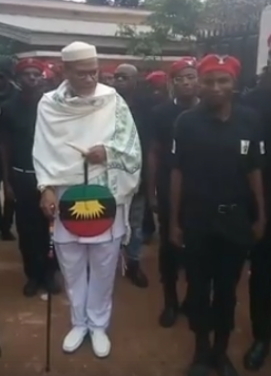 Has Kanu not been saying that the Niger Delta is part of Biafra? It is right there in the old map prior to the amalgamation. 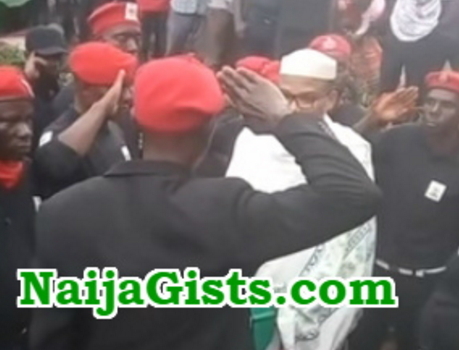 So why wouldn’t Kanu entertain supporters from the Niger Delta? THE AGENDA HAS not shifted; it remains what it had been. Biafra is unstoppable! The spirit that propels it cannot be distilled out. This is what the Nigerian government did not realize in time. 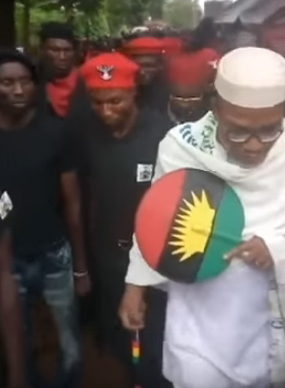 Nigeria is already an anarchy, and Biafra is only a sense struggling to emerge from the nonsense; an order coming out from the heap of disorder. If these are the set of people made up of Biafra, I’m not angry nor bother again . Chei .where are the online warriors, why just these hungry looking people ? Chisos .. Biafran soldiers? One million peace military standby. I stand down for biafra.we are not part of nigeria and we will never be part of nigeria never ever. 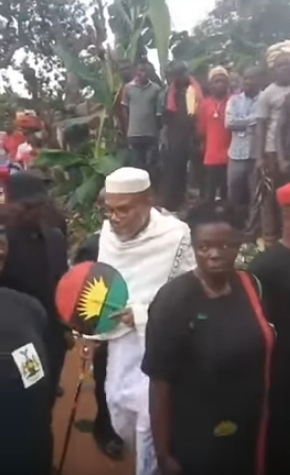 we here in europe need account number from radio biafra where we can donate money for bullet proof to proctect biafrans incase the animals attact. Thank GOd this is not 1966, with hundred thousand euro and a trip to moscow or serbia you can buy enough arms to make a little war. Every biafran should be ready mostely those living outside phisically, spiritually and financially. He who brings home ant infested wood should not complain if he is visited by lizards. Omar Mukhtar infamous attire bootlegged by the leader of so called zionist extention state. You’re calling them names? To you, isn’t this already becoming a threat to the national security, due to the stiffneckedness and failure on the part of the Nigerian federal Government to respect the sel-determination of the secessionists movement calling for a peaceful referendum so as to break away from the colonial contraption called Nigeria? Do you know that Biafran agitation is lawful, legitimate and in tandem with international law backed by the united nation? So if you think this men are mad and are jobless people headed by a confused man,then I will urge you to have a rethink. 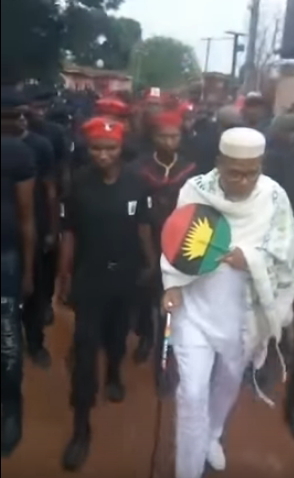 The eyes of the international community are seriously on the Nigerian Government watching how they will handle this delicate situation in case it spilled out of control into armed conflict, so they can see how best to respond which will mostly likely be in favor of the Biafrans. So do not view what is happening here as a waste of time on the part of jobless agitators but rather look at them as those fighting for a just course. Thankfully, the situation on ground is a powerful testimony that we are gradually drifting toward the threshold of actualising the Biafran dream. As soldiers are being trained I hope the footages on refugee crises around the world are carefully watched and that there is a plan for refugee management in this region in event of crisis? With the huge population of Nigeria and the current extreme hardship and poverty, the safety and management of the populace that will likely form the population of your new country should be of concern to any new leader as the utopian State is dreamt up. we don’t need another hero. it is the poor man that will suffer the brunt of all this nonsense. in a war scenario there are no winners. 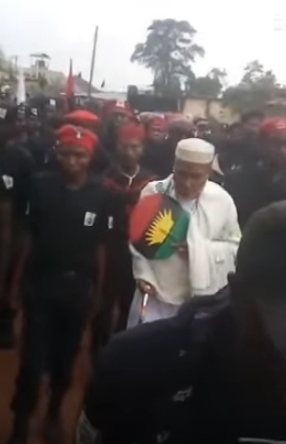 Honestly Speaking, Any Nigerian youth that look at this Biafra movement and call them fools should examine himself. Do you need anybody to tell you that, that country call Nigeria through the hand of few people has being wasting the resources for the future of our children, and what made people think to reconstruct Nigeria will be possible when those cabal are still alive? Its time to speak.. enough is enough!! In Nigeria,There is no common Electricity, road, and we have rivers everywhere yet, Nigeria government could not give us water.. Biafran’s messages are simple, Enough of Slavery in our Land.. Our Children have no future under the country call Nigeria.. Old people that have served the country in their youthful age and their pension entitlement has been embezzled by one person and no justices, No healthcare services, when these so call rich people are sick, they will travel to another man country for a medical check up and the most funny part of it, you will see in Abroad hospital are Nigeria Doctors trained in Oversea.. Who is fooling who? Anybody that want all these that I above measured in Nigeria to continue is an enemies of peace and he or she is slave in his Land, so it will remain. How can people that have vowed to destroy Nigeria to be glamouring for reconstruction? Didn’t common sense tell us that they are finding a way to silent the agitation and to continue with the same policy that has brought the country to its kneel. Its time for Nigerian’s to Stand up to their right in-respect of tribe, religions or location. Imagine; Educational system in Nigeria is Zero..Are we to talk about the Judiciary system that favor only the rich? Enough is Enough. In my own opinion, the foundation in which that Country(Nigeria) was built upon is corrupt..
Now we know those who have been bringing arms into the country. These people are ready for war and I pray its their own blood they will shed. They should take their Biafra and all their kinsmen all over the country should go and meet them. At least, we can see how much ‘enjoyment’ Libya has now post Ghadaffi. This is where I feel concerned for those in intertribal marriages. The children will bear the brunt because either parent will stick to his/her tribe. These shallow minded people think its only about having their own country. Your kinsmen wey no follow u do wahala go join u suffer. All over the country, they will be asked to leave, then tyranny will begin in the so called Biafra and other tribes wont accommodate them again. Anyway sha, make Cameroon, Togo, Benin republic and Ghana de prepare to recieve guests! Rebel militants is building up , just like Congo , if not properly and quickly check Another war is coming . 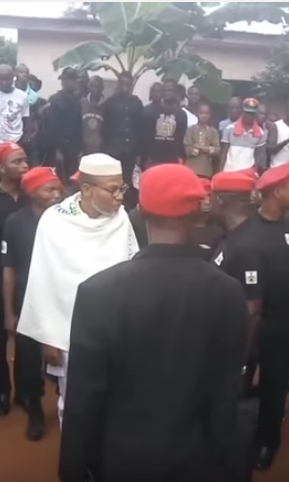 I salute your courage Nnamdi Kanu,may God continue to protect and guide you….your real soldiers are not visible. Nobody is calling for war,enough was already sacrificed for this matter,this is only redemption time. They should move out of Nigeria and create their own country, State, Republic or whatever they choose to call it. You guys will just die like “nanmo” – cow meat. Kanu is playing Russian roulette with these vulnerable lives. He is starting what he cannot finish and will abscond and abandon you at the last minute Ojukwu saga repeating itself. I hope your mothers have other children to console them and replace you when you die. You are not contributing anything to Nigeria but adding to her woes so nobody will miss you when you reach your Waterloo. Those asking to send money from abroad should return home to join your movement if they truly love and believe in your movement. It’s easy to shout “war” when we are in a safe zone and our children’s lives are not at risk. We shall keep watching and see where this will end. God deliver Nigeria from evil in all ramifications, including those in government present or past, amen.